Their stories are, unfortunately, all too common. The fact they happened around Christmas is a reminder that heart disease can strike anyone at any time. So as you cherish the time you spend with your loved ones, please also be wary and take any symptoms seriously. For Deidra Lincoln and Lacy Hardy, the emotions surrounding Christmas have changed. While they joyfully celebrate with their families, heart disease has brought a new dimension to each holiday season. Deidra nearly died the day after Christmas one year. Lacy lost her father one Christmas Eve. Yet in the true spirit of the season, the essence of these women's stories is not what happened, but rather what they've done since. Both are now devoted year-round to improving the health of others by spreading awareness about heart disease. On behalf of the American Heart Association, I wish you a joyous holiday and my best wishes for health and happiness in the coming year. Two years ago, Deidra Lincoln hosted her typical Christmas dinner, serving prime rib, turkey, ham and more for 15 people in a gathering that she laughingly describes as "a little Martha Stewart-esque." The next day, she joined her husband and son for hours of gift returns and day-after deals around their hometown of Shrewsbury, Mass. So when she felt wiped out, she figured that she'd just overdone it. "I thought everybody was that tired the day after Christmas," she said. But everybody doesn't have extreme chest pain, nausea, vomiting, sweating and arm pain. A trip to the hospital followed, as did a quick diagnosis. "I could hear them saying, 'heart attack,' and all of a sudden I felt in a fog -- were they talking about me?" she said. "They discovered I had a blockage. I went right into surgery and they inserted a stent. I was very lucky." Deidra had some complications over the next year, yet she celebrated Christmas 2012 almost as Martha Stewart-esque as before. The key difference: "Everybody chipped in and shared the load." The day after Christmas was quite emotional. The first anniversary of her heart attack was filled with "everything from happy-to-be-here tears to I-still-can't-believe-it-happened tears." She avoided the stores last Dec. 26 and plans to again stay home and count her blessings. Among them is teaching others what she's learned: That heart disease is the No. 1 killer of women, claiming more lives each year than all forms of cancer combined; and that more women die of heart disease each year than men. "I was one of the people who thought it's a man's disease," she said. "My dad died at 38 from a massive heart attack and I thought it was going to happen to my brothers. I worried about them, not me." She spreads the word through Go Red For Women, the American Heart Association's movement that teaches women about their risks and how they can reduce them. Her son -- a brain tumor survivor who's been a spokesman for the Boston-based Jimmy Fund for 13 years -- encouraged her to become involved, and she loves it. She's become healthier, too, as have her loved ones. "We've all stepped up our healthiness tenfold," she said. "Sharing this experience together has been so fulfilling. And to share my words and message with all these other phenomenal women and mothers and aunts and grandmothers? It feels like a gift." On Dec. 23, 2006, Lacy Hardy enjoyed a wonderful day with her dad, Terry Brondstetter. They spent about four hours driving around the Auburn, Mich., area so Terry could see his other five kids and all nine grandchildren. Everyone was gathering at his house the next night for their annual family Christmas, so this trek was a bit unusual. But it was what he wanted to do, so Lacy was happy to help. Besides, it included a lot of peanut butter fudge -- so much that they both wound up with heartburn. That night, Terry did something else out of character. He made a huge batch of frozen margaritas for the party. He called Lacy to tell her about the drinks, then fell asleep in his favorite chair. He never woke up. A massive heart attack claimed his life at age 62, turning the family's beloved Christmas Eve celebration into a day of mourning. Part of the sadness is what might've been. Terry was showing many warning signs, but he downplayed or ignored them, as did his family. "At Thanksgiving, he was wearing a sweater and slippers and was still cold, which was weird because he was always hot," Lacy said. "About two weeks before, he asked me about getting stuff for his nails because they were detaching from his finger. Both of those were signs of poor circulation." Terry had recently bought a new truck -- and took out insurance to pay for it should anything happen to him. He died before even making the first payment. And that fudge-induced heartburn? He'd actually been having it for months. "The signs are all so obvious now," Lacy said. "We should've gotten him to a doctor." Presents for Terry were tearfully removed from under the tree. The ones from him were opened -- and treasured. "I have five sisters, and he bought us all a necklace with three little angels on it -- Faith, Hope and Love," Lacy said. "We each took an angel out of our box and left it in the casket with him." In 2009, Lacy decided "to stop feeling sorry for myself and start giving back in some way." A few seconds later, she received an email about her company, Dow Corning, seeking volunteers for a Go Red For Women function. "I thought, `Oh my gosh, thank you Dad,' and I accepted immediately," she said. She's remained involved. Now, she's the committee chairperson for Dow Corning's Go Red For Women Luncheon on Feb. 6. Since learning more about heart disease, her focus is teaching others to listen to their bodies. "Don't brush off symptoms or say you're too busy," she said. "They may not seem like a big deal, but they might be. If you won't do it for yourself, do it for others you love." 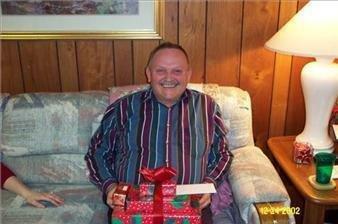 Terry's absence still looms every Christmas, especially because of how much he loved the holiday. He was the type who went all-out decorating the tree and putting up lights outside, and could often be found wearing a Santa hat. "We've gotten to the point where we can laugh and tell stories and think of all the fond memories," Lacy said. They also have a new tradition: frozen margaritas. Terry's initial batch was so big it lasted them two Christmases. They make a fresh batch every year, and the sisters with two angels on their necklaces raise a glass in beloved memory of their father.